If you ever ask what skill game requires the most strategy and where the brightest minds can excel, almost everyone will answer with the game of Chess. Originating from an ancient game in India, Chess spread through Europe in the 11th century and ultimately throughout the rest of the world. Chess, if you are not familiar, is a two-player board game played with a variety of different pieces that each have different capabilities. The game is constantly revered for being the premiere strategy game, as there is zero luck involved. There are no dice spins, coin flips or anything that is left to chance. The superior player is going to win every single time, so long as they don't make a mistake. The best in the world are regarded as master's, and several popular movies have been made about famous Chess players. If anyone ever tries to tell you Chess is easy or that there is luck involved, you can proudly tell them that they have no idea what they are talking about. These pieces are organized in a set manner in the back two rows closest to each opponent. You have no control over how the pieces are set; they are always set the same way. The game always starts with the player playing the white pieces. Players take turns back and forth moving one piece per turn. If the piece they move occupies the space of another piece of their opponent, their opponent's piece is removed and is considered captured and out of the game. Where people start to get a little confused with Chess is in knowing how and which directions each piece is allowed to move. Once you learn this, though, the rest of the game is simple. The King piece is only allowed to move one space horizontally, vertically, or diagonally. The King is not allowed to move into a space where they will be captured, or they would effectively be ending the game and losing. If your King piece is ever at risk, your opponent will let you know by saying "check." You are then forced to either move your King out of harm's way or move a piece in the way to block the attack, so the King won't be killed. If you are unable to do either of these moves, your opponent will say "checkmate" instead, and the game will be over with you losing. The Queen is one of the most powerful pieces on the board as she has a lot of versatility in how she can move. She can move as many spaces as she wants and in any direction horizontally, vertically, or diagonally. She is not allowed to jump any pieces though so can only go as far as is able. Sometimes referred to by amateur players as the castle, the Rook is able to move as many spaces as possible, but only vertically or horizontally. The Rook is not allowed to jump pieces, though, it does have one special move that it can do only with the King piece. This is called Castling, and we will discuss it in the special moves section below. The Bishop is similar to the Rook except instead of horizontal and vertical, it can only move diagonally. It cannot jump over any pieces and cannot be part of a Castling maneuver. The Knight seems to be the piece that confuses people the most, though, it is quite simple once it is broken down. First of all, the Knight is the only piece that is capable of jumping over other pieces. The Knight is able to move in an "L" shaped direction in any direction. The "L" is either two squares vertically in either direction and one square horizontally in either direction, or it is two squares horizontally in either direction and then one square vertically in either direction. On a pawn's first move, it can move one or two spaces forward or one space diagonally if it is capturing an opponent's piece. 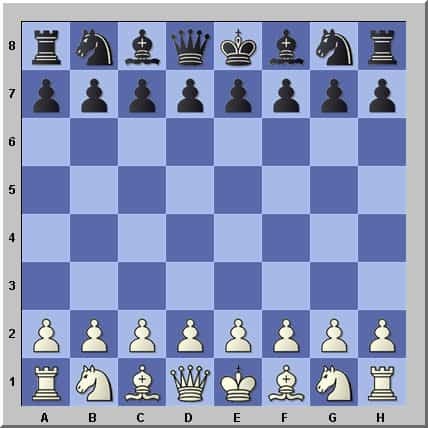 All other turns for the pawn will be either one space forward or diagonally if it is capturing an opponent's piece. The Pawn cannot jump any other pieces and also cannot attack moving forward. If there is a piece in front of the Pawn, there is nothing that the Pawn can do about that. While these are almost all of the move capabilities of the pieces, there are a few special occasions where things can be a bit different. Most of these are somewhat rare, but you might see them, and they are definitely part of a lot of top-level strategies. This move is only allowed to be done once in a game per player and is a special move involving the Rook and the King. The King can be moved two spaces towards the Rook (in its starting position), and then the rook is placed on the last square that the King just crossed. Basically, the King is sliding towards the Rook, and the Rook moves towards the King and slides around to the back side of the king. This can only take place if neither piece has moved at all yet, there are no pieces in between the two, and the King cannot Castle to get out of check. Also, if one Rook moves, this does not disqualify the other Rook from being involved in a Castling maneuver. As we mentioned earlier, the Pawn is allowed to move two spaces vertically in its first move only as long as there are no pieces in its way. We also said that Pawn could only capture other pieces in a one square diagonal move. This is true except for this one special occasion. If a Pawn moves in its first move two spaces forward and stops next to an opponent's Pawn, that opponent has the ability to move diagonally behind the pawn that moved two spaces and also remove the piece as captured. This is completely different from a usual capture where you must move onto the square the other piece is occupying. The term means "in passing" in French because the piece is being captured in passing. It's important to note that this can only occur between two Pawns and the Pawn being captured must have just moved two spaces the move before. If you're a Checker's player, you might see a lot of similarities to getting "kinged." If one of your Pawns makes it across the entire board, the Pawn can be exchanged for your choice of Queen, Rook, Bishop, or Knight. Most people choose the Queen as she is the most powerful piece, but on occasion, certain strategies will choose a different piece. When this happens, it is referred to as underpromotion. As we mentioned earlier, the game is won by capturing your opponent's King or trapping them where they have no escape and will be captured on the next turn. If your opponent puts your King at risk of being captured on the next move, they must let you know by announcing "check." If you are in check, you MUST respond or else you lose the game. You can respond in three ways. First, you can move your King to a safe square where it is no longer in danger. Two, you can move a piece in the way of the attacking piece to protect your King. Three, you can attack and capture the piece that is threatening your King. If your opponent has you where you have no options to save your King, they will announce "Checkmate," and the game is over. Almost any player that has gotten really good at Chess has had one major advantage. They have had a lot of different opponents and a lot of quality opponents to compete against. There is no way to get good at Chess without having these two things. Unfortunately for most of us, this isn't a luxury we have. We might have some family members or a few buddies who like to play, but for the most part, our Chess circle is small. The internet has changed that significantly. With the click of a button, you can be playing with opponents from all over the world. Some of these opponents may be novices that you can practice new strategies on and some may be masters that you'll need to bring your A-game to beat. You used only to be able to play on the computer against other computer bots, but now you get the luxury of trying your skills out against some of the best in the world. Sites online allow you to play for free which is awesome if you are just learning the game or trying to get more comfortable with how all the different pieces move. They also offer real money games which are great for ensuring an authentic experience or for making some money if you're good. People might be tempted to play a little crazier or leave in the middle of games when it's for free, but when you put money on the line (even just a few dollars or less), people will immediately take it seriously. This gives you the absolute best training environment possible. No longer will the masters just come out of the places that have a big Chess presence. You can become a master at the game from the comfort of your own home. We've gone ahead and done the hard labor in finding the best sites for you to begin or continue your Chess playing career on. The most important aspects of a good site offering Chess are a great interface with easy to use controls, game histories to allow you to study your play, and a deep player pool so you can get the ability to play as many different opponents as you'd like. Pick one of these sites below and get started playing now! Do you think the Chess Masters waited until tomorrow to start playing? Chess strategy might be as diverse and deep as actual war strategy or something else that big. For that reason, we aren't even going to try to get into exact move specifics or the specific strategies as there are thousands of them and thousands of several hundred page books that have been written about it. What we can do, though, is give you a few ideas of how you should work at developing your own strategy. Speaking more theoretically, this will help you to develop a roadmap to being a top player as long as you are willing to put in the time studying and practicing. The most important aspect of any Chess strategy is never to get tunnel vision. You need always to be looking at the big picture and not just a move or two ahead. The real masters can see how they want the entire game to play out, all the way down to capturing your King. You need to start studying and thinking this way. The second you get distracted and look at only one part of the board is the second a good player is going to take advantage and go for the win. Secondly, you need to make sure that you don't just learn one strategy. Your strategy needs to be able to react to different types of opponents. This is the reason practicing against a lot of different opponents is of so much importance. If you try the same approach to every opponent, it may work with some of them, but not with all of them. Study lots of different strategies and make sure that they are all adaptable to the ever changing game conditions. It's like Bruce Lee said, you have to be like fluid like water to be effective. If you come into rigid with your strategy, you're going to struggle to get what you want done. Lastly, of course, make sure you have fun! You may not see this written in any strategy books, but we're fairly confident that it is an important part of an effective strategy.